In a quest to contribute to the welfare of elderly citizens, the department of Health and Social Development under the guidance of Ms Candith Mashego-Dlammini hosted an elderly citizens event wherein senior citizens were showered with blankets. The event was held adjacent Margaret Manana Community Hall on the 07thDecember 2013. Speaking at the event, the MEC of Health and Social Development Ms Candith Mashego-Dlammini reiterated the remarks uttered by President Jacob Zuma during his Luncheon meeting with senior citizens. “We are here to reaffirm that senior citizens are important to this country and should be taken seriously “alluded the MEC. The MEC urged the senior citizens to form cooperatives and committees to help address issues that they have to contend with on the daily basis. She also emphasized the importance of involving older persons in decision-making and policies that affect them. A Victim empowerment centre was officially opened by the honourable MEC and the centre will be home to victims of abuse. 15 poor families were given food parcels and the MEC made a clarion call to the business sector to help reduce the burden on the shoulders of the government by making a difference to the lives of the less fortunate. The event was convincingly attended as more than 5000 senior citizens were transported to and from the event. 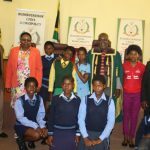 Amongst those who attended were the Executive Mayor of Bushbuckridge Cllr Renias Khumalo, MMC’s and councillors, Kgoshi L.M Mokoena, community members from all walks of life who accompanied the senior citizens and heads of department from both the district and provincial health and Social Development.